We understand that correctly repairing your vehicle is only half the job. The other half is making you happy, and providing the kind of service you can rely on for years to come. Check the appearance of the repaired area both close-up and from a distance. Examine the paint for color match, texture, and overspray. Take a test drive to check for mechanical repairs if any were required. If not satisfied with the work, mention your concerns immediately. In the worst cases, have the repair work inspected by an independent repair facility. Poor alignment: Is the car pulling to one direction after the repair? This could be indicative of a bent frame or misaligned unibody structure. While some vehicles can be rightfully straightened after a crash, those that can’t typically will not drive straight and wear out tires quickly. This could also cause the vehicle to handle poorly and having the vehicle aligned may not fix it. Has your car been clipped? This is a big no-no nowadays. Clipping means that an entire used section from a different vehicle (such as a complete front end) has been welded on to the rest of the vehicle. While this was a common practice 20 years ago, newer cars are made from lightweight high-strength materials and welding a whole new used section of the car to these metals may cause structural weaknesses that could prove fatal in a subsequent crash. Was your airbag replaced? This is less of a blunder than it is an unscrupulous practice by less-than-reputable auto collision centers. Airbags are expensive and could fetch big money on the black market. Some shady repairers will charge the insurance companies for new ones, won’t install them, and then will sell them out the back door. If your airbag light is on or if the center of your steering wheel sounds hollow after knocking on it lightly, get it checked out. 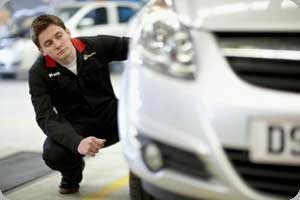 Aftermarket and Used Parts: Believe it or not, some insurance companies may require that auto collision repair centers utilize aftermarket parts that may not meet the original manufacturer specifications, or they may allow used structural parts that may be against manufacturers’ recommendations. Ask the collision repair center to see the invoicing/receipts for the parts used on your car. An inferior or used part can make a huge difference if you have another accident. Torque: This is extremely important. If your car requires the replacement of suspension parts, they absolutely need to be torqued to manufacturers’ specifications. Failure to do so could result in a loose assembly that will negatively affect handling and performance. Ask the collision center what procedures they follow when replacing suspension parts and ask if they can provide you with the torque specifications. We are open Monday - Friday from 7:00am to 7:00pm. You don't have to rush over from work to drop off or pick up your car.